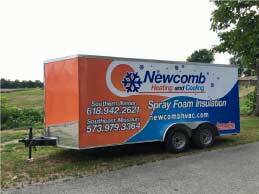 Newcomb Heating and Cooling now includes Spray Foam Insulation as one of our services we provide. We feel insulation and proper airflow is key in producing efficiency and comfort in your home or place of business. We have a mobile trailer that we bring to location where we are capable of spraying either open cell or closed cell foam to produce your desired results. Moisture Barrier- Not only does air get through your walls or ceiling but water as well. Spray foam is impermeable to water. This means, if your house was ever damaged by water, foam will not absorb water like other types of insulation will. Longer Life Span– The polymer that spray foam is made up of allows it to have an indefinite lifespan. Studies show that homes are still benefiting from their spray foam after 20 years. Spray Foam insulation is Eco- Friendly! This product is designed to save you money, prevent mold, and moisture as well as last indefinitely. Both Open and Closed cell foam have their own list of benefits. Our spray machine offers more than just insulation. We can also spray other applications such as Expando-Thane, for water resistance. EPS Hard Coat and Rock Hard bed-liners. Give us a call today to talk about your options and whats best for you!